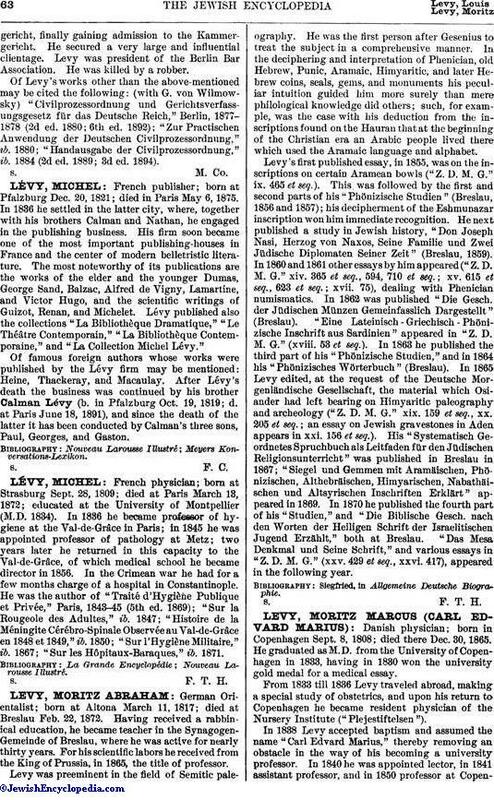 French publisher; born at Pfalzburg Dec. 20, 1821; died in Paris May 6, 1875. In 1836 he settled in the latter city, where, together with his brothers Calman and Nathan, he engaged in the publishing business. His firm soon became one of the most important publishing-houses in France and the center of modern belletristic literature. The most noteworthy of its publications are the works of the elder and the younger Dumas, George Sand, Balzac, Alfred de Vigny, Lamartine, and Victor Hugo, and the scientific writings of Guizot, Renan, and Michelet. Lévy published also the collections "La Bibliothèque Dramatique," "Le Théâtre Contemporain," "La Bibliothèque Contemporaine," and "La Collection Michel Lévy." Of famous foreign authors whose works were published by the Lévy firm may be mentioned: Heine, Thackeray, and Macaulay. After Lévy's death the business was continued by his brother Calman Lévy (b. in Pfalzburg Oct. 19, 1819; d. at Paris June 18, 1891), and since the death of the latter it has been conducted by Calman's three sons, Paul, Georges, and Gaston.